NOCTURNAL BLOODLUST w/ Blessthefall, ATTILA & More @ SCREAM OUT FEST MMXVI | VKH Press – J-Rock & Visual Kei Coverage Worldwide! Recently the company Triple Vision announced the final lineup for the Japanese music festival SCREAM OUT FEST MMXVI. J-rock bands NOCTURNAL BLOODLUST, THE KANMURI, and ANOTHER STORY will be sharing the stage with some well know emo, metalcore American bands such as Blessthefall, ATTILA, Get Scared and more! 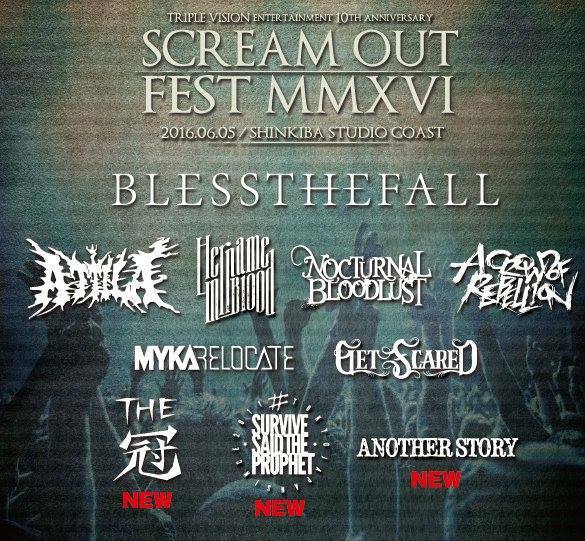 SCREAM OUT FEST MMXVI will be held at SHINKABA STUDIO COAST on June 5th. Triple Vision is also celebrating their 10th anniversary this year, so you can be sure that this fest will be one to remember!